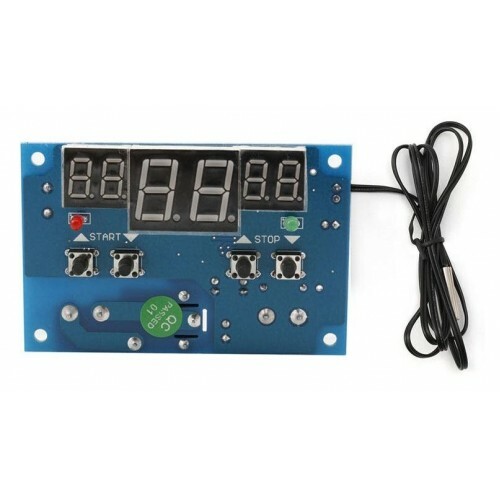 XH-W1401 is a 12 volt Intelligent digital Thermostat module. XH W1401 is a dual temperature controlled thermostat. This module can control both heater and cooler and you can set it according to your application. A NTC temperature sensor is provided for monitoring temperature from a range of -9℃ to 99℃. A relay is providded for AC or DC load control the relay can control upto 10 ampere. 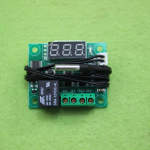 The module input voltage (supply voltage) is 12 volts DC. A simple Temperature Sensor Module with 30A Relay. Cooling Mode: Set the starting temperature> stop temperature, when the detected temperature ≥ start temperature, the relay is closed, refrigeration equipment work; when the detected temperature ≤ stop temperature, the relay is off, refrigeration equipment stops working. For example: Set the start temperature is 30 ℃, stop temperature is 25 ℃, when the detected temperature ≥30 ℃, the relay is closed, start indicator (red) light; when the detected temperature ≤25 ℃, the relay off, stop instruction light (green) light. Heating mode: Set the start temperature <stop temperature, when the detected temperature ≤ starting temperature, the relay is closed, heating equipment work; when the detected temperature ≥ stop temperature, the relay off, heating equipment stop working. For example: Set the start temperature is 25℃, stop temperature is 30 ℃, when the detected temperature ≤25 ℃, the relay is closed, start indicator (red) light; when the detected temperature ≥30 ℃, the relay off, stop instruction light (green) light. W1209 Mini Thermostat Temperature ControllerW1209 Mini thermostat Temperature controller is low cost..